More . . . and more . . ...celebrations! 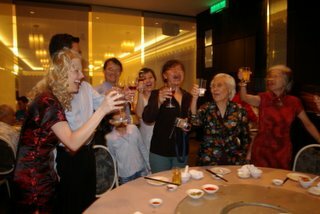 We were given wonderful dinner receptions in Kuala Lampur and Singapore to celebrate the wedding with William's families. I really love William's family and felt at home with them. We spent most of our time in Kuala Lampur visiting with family and exploring the city. We also met up with William's childhood friend, Andrew. We were able to spend more time with William's parents (who had just returned from the States to attend our wedding) and also his sister, Elaine and her husband and children, Joshua, Ruth and Sara. It was a treat to finally meet them. Kuala Lampur is a beautiful and modern place and very westernized, and is an Islamic state. William's family is the most hospitable, friendly and welcoming group of people that I have ever encountered. I am blessed with the best in-laws :) Singapore was even more westernized and very clean, as to be expected. We also were able to meet some of William's friends from college days that had moved back to Singapore. I am looking forward to returning and hope we get back very soon. We loved this resort and highly recommend it to others. The beach houses on stilts were very romantic and beautifully designed. The sea breeze was constant and it was nice to have the privacy of a small "beach house". The food was included in our package - and we had our choice of restaraunts on the private island. . . authentic, fresh and delicious. We spent much of our time at the amazing spa which is actually rated one of the top spas in the world. We enjoyed our massages, body wraps, spa baths, foot-poundings and all the little luxuries from a very talented and comforting staff. We also went on a tour of the rainforest on the island from a young American guide - who was studying Botany at Cornell - William's alma mater. The rest of the time was spent developing our professional skills at lounging - specializing in pool and beachside. We spent our first week in Malaysia at the resort and then traveled to Kaula Lampur and Singapore for some additional family receptions. Shelley and William got married in Houston, TX. Thanks to everyone who joined us in the ceremony and reception....and especially to those who traveled to Houston. And thanks also to those who couldn't be there and sent us their best wishes. It was a perfect day for us and we couldn't have been happier during our special celebration. 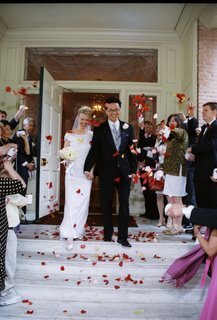 We were married at First United Methodist Church in downtown Houston and our reception was held at the River Oaks Junior League.